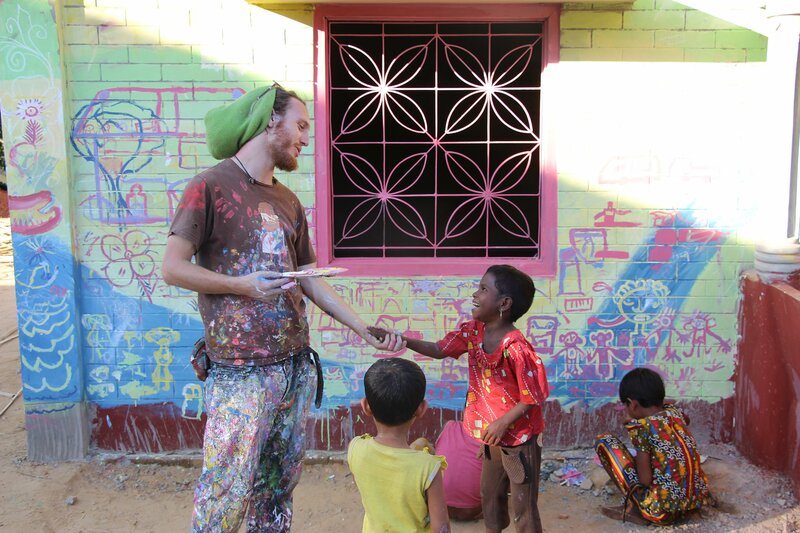 Max Frieder is the co-founder and co-executive director of Artolution, a nonprofit that brings community-based public arts education to marginalized and conflict-affected populations. 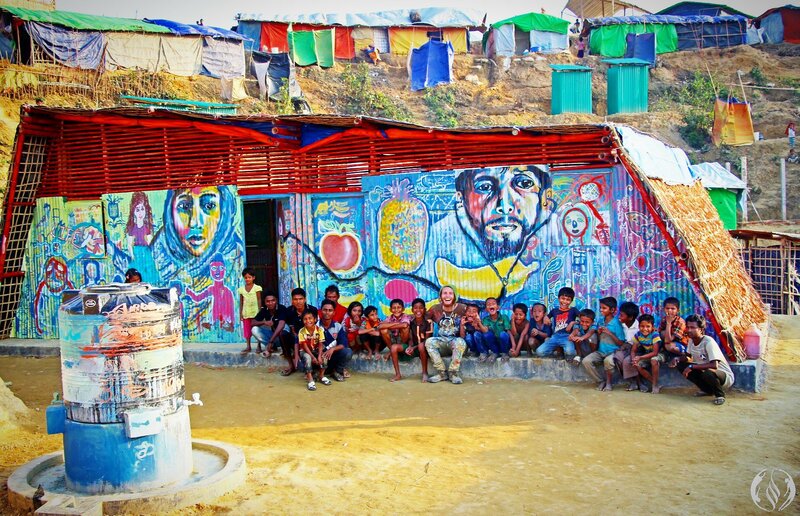 His most recent project, done in collaboration with Save the Children, took him to the Balukhali Refugee Camp in Cox’s Bazaar, Bangladesh, home to Rohingya refugees. “The level of suffering here is unimaginable. The camp is an unending sprawling sea of makeshift shacks overcrowded with people, children running wild with no clothing. There is child labor everywhere you look. Children are carrying rocks on their backs, bamboo on their shoulders, and dragging sheets of plastic. Women are completely covered in Islamic garb, and often have children dangling off of them. Many of the men have yellow eyes, hardened faces. We passed one man clawing at himself, his eyes a pale light blue, completely glazed over with blindness. He was covered in bugs. We climbed and climbed to the tops of peaks carved out of the mountainside, where the learning centers are. It was myself, a translator, my grassroots partner Adam, and our team of four local Rohingya refugee artists. The first center we went to was situated below a larger hill, and had swarms of children everywhere you looked. The children were excited by the possibility of interacting with us. They looked at me like I was a creature from another planet, with a giant smile on my bearded face and paint-encrusted clothes. When I arrived, we sang and danced and played games of call and repeat, using sounds and body movements. The way that the children laughed showed a craving for attention, a craving to be treated as human. "One of the girls drew a picture of a person with a gun shooting at her house. She spoke of the people with guns who burned down her village." We also drew pictures, which we put up on the wall, and through a translated group dialogue, children came up with a story we turned into community murals and “Foundstrument Soundstrument” interactive recycled percussive sculptures— the only works of community made public art in the 800,000-person camp, now the largest in the world. One of the girls drew a picture of a person with a gun shooting at her house. She spoke of the people with guns who burned down her village, and said that she would only go back to Rakhine state if the rival group was killed. Many of the children drew images of people with guns, and people dead. 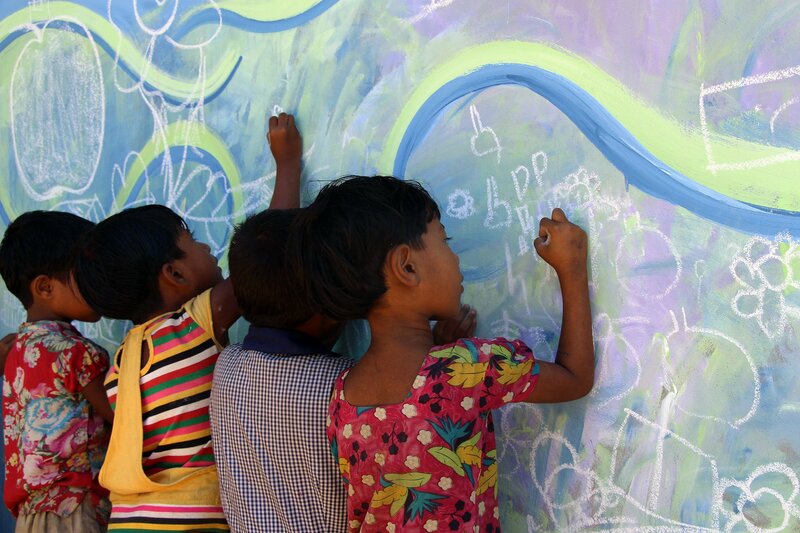 However, the majority of the children drew images of children, animals, houses, flowers, and dreams for a new life. There is an incredibly low level of literacy here. Approximately 77% of the population cannot read or write. Rohingya is only a spoken language, which makes language acquisition skills particularly difficult for children. Because many of the children model themselves on their parents, who are not educated, many of them do not have the opportunity or support to make it past or even into elementary school. They may not be able to read or write, but children can draw, paint, sculpt, and express themselves no matter where you go. Even people who have suffered serious trauma and displacement have an inherent need and thirst for fun. We did a mask-making workshop, which was like creating an entirely new planet for these children to live on, at least for a few hours. We had collected offcuts of fabric that had been discarded on the side of the road. When we brought out the massive bags, it was like pouring out presents for all of the children. They excitedly sifted through the different colors. "The act of changing one’s being and identity into something magical helped the kids let down their guard." Immediately after we brought out the fabric, the entire center descended into a dance party. The children began to rip apart the bag and turn all of the fabric scraps into confetti. You could tell they simply craved a reason to celebrate something, anything. A reason to jump for joy for no reason at all, a reason to throw fabric in the air and yell and scream and let out all the emotion pent up inside of them. 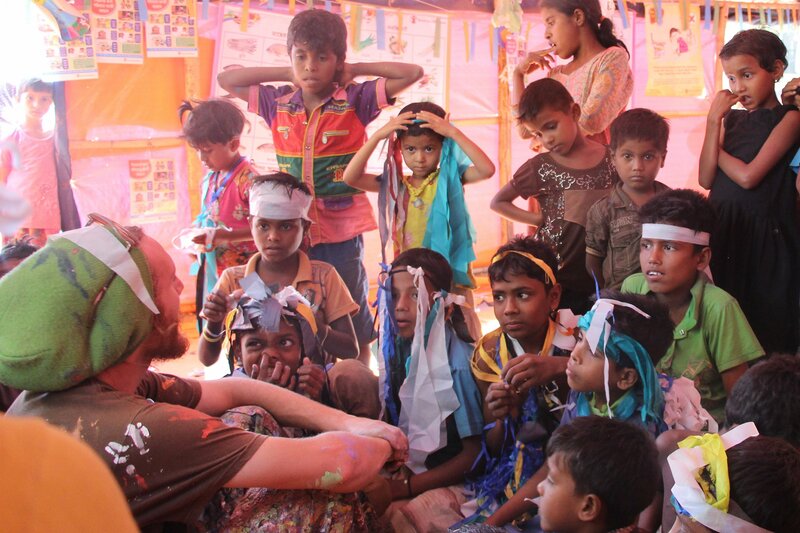 The feeling was contagious, and local men and women joined in with the children and began dancing and jumping and throwing the fabric scraps up in the air and covering themselves in the material. The fabric felt like it represented all of the hidden emotions these children and adults had that needed to be let out. They asked me to tie the different fabrics around their heads, holes cut around the eyes so that they looked like little superheroes. The looks of trauma and fear receded, and you could see joy and love flit across their faces. The act of changing one’s being and identity into something magical helped the kids let down their guards. The arts have a special role to play in areas affected by crisis and displacement. The value of play and imagination in crisis-affected areas need to be viewed as a portal into a world where abuse, neglect, trafficking, and re-traumatization can fall away. In a refugee camp, lifesaving measures come in many different forms, and education, especially arts education, is one of them. The day-to-day life of the individuals here in the Balukhali Refugee Camp is a bleak combination of waiting, hopelessness, and feelings of worthlessness. Something as simple as a community re-discovering play through throwing up fabric scraps and dancing, banging on a sculpture made of trash, and creating a public mural that is seen on a daily basis, has positive psychological and social influences beyond measure. This feeling of joy is coupled with feeling of accomplishment involved in painting a community mural, which continues to live in this community as a reminder that this magic happened. These murals and interactive percussive sculptures were the first community-made public arts pieces created in the camps. I have done everything possible to set this up as a model for the future, to make it a project that can be carried on by local artists, who will continue to bring light and color to the camp.